Anindyatrans is a Sworn Translation Office in Indonesia provider of sworn translator, attestation and sworn interpreter services in Indonesia for English, Chinese, Japanese, Korean, Arabic, German, Dutch and Spanish under Indonesian Sworn Certificate License No.527/1995. We have 7 branch offices throughout Indonesia i.e: Batam, Jakarta, Bekasi, Bandung, Semarang, Surabaya and Bali. 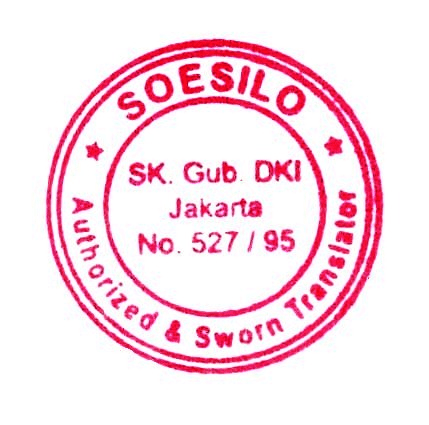 We are a registered legal entity and currently recorded at the Ministry of Justice and Human Rights of the Republic of Indonesia, the Ministry of Foreign Affairs of the Republic of Indonesia, the Indonesian National Police, the State Attorney, the Court of Justice & Arbitrage to provide sworn translation and interpreting services for 9 languages. Our Interpreting Services consists of simultaneous and consecutive interpretation for languages of Chinese Korean English German Arabic French for Court, Police or Meeting in Jakarta with types of Japanese Interpreting Services in Jakarta for event such as In-house Meetings, Conferences, Seminars and Training, International forums, Business Negotiations, Sightseeings, Broadcasts, Trade show Booths, Phone Calls / Conference Calls (including Internet calls using SKYPE).